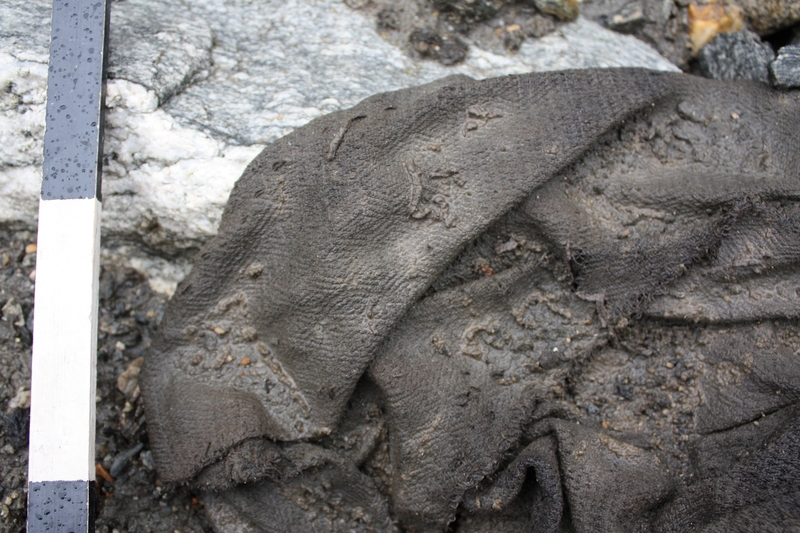 In 2011, archaeologists exploring the rapidly melting Lendbreen glacier in Norway’s Breheimen National Park discovered an intact woolen tunic dating to between 230 and 390 A.D. It is the oldest garment ever found in Norway, and it wasn’t new when for unknown reasons it was left on a glacier to freeze solid. There are several patches and the sleeves were sewn onto the tunic after the original manufacture. Although it could have been decades old, it was still entirely in wearable condition, and yet it was found bundled up and covered in horse manure. Archaeologists speculated that its 5’9″ wearer removed it believing himself to be hot, a common delusion caused by hypothermia, but it may also have been put to some other purpose rather than as clothing. Its exceptional condition and the visible repairs afford researchers a unique chance to examine Iron Age wool, textile production and garment construction. 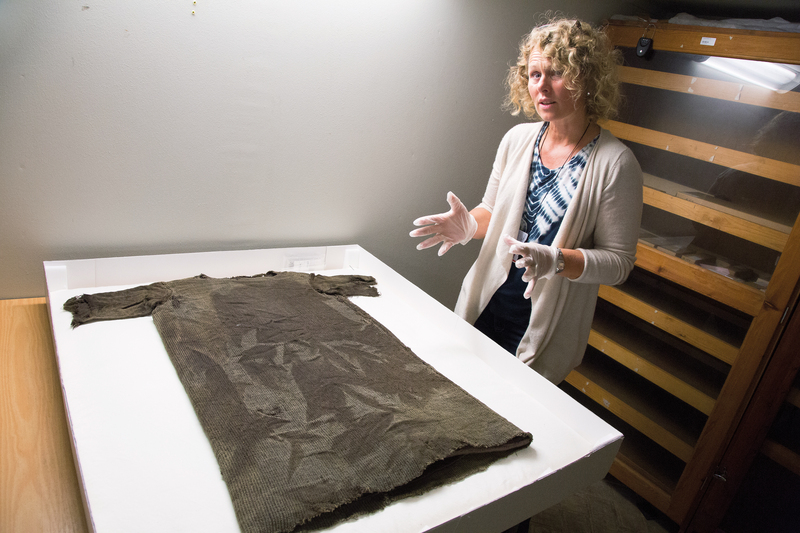 To learn more about how the tunic was made, two museums — the University of Olso’s Museum of Cultural History and the Norwegian Mountain Museum in Lom — will create reproductions using traditional techniques. It’s going to be a highly detailed and complex process that enlists the labour of expert craftsmen. First they have to source the proper wool. 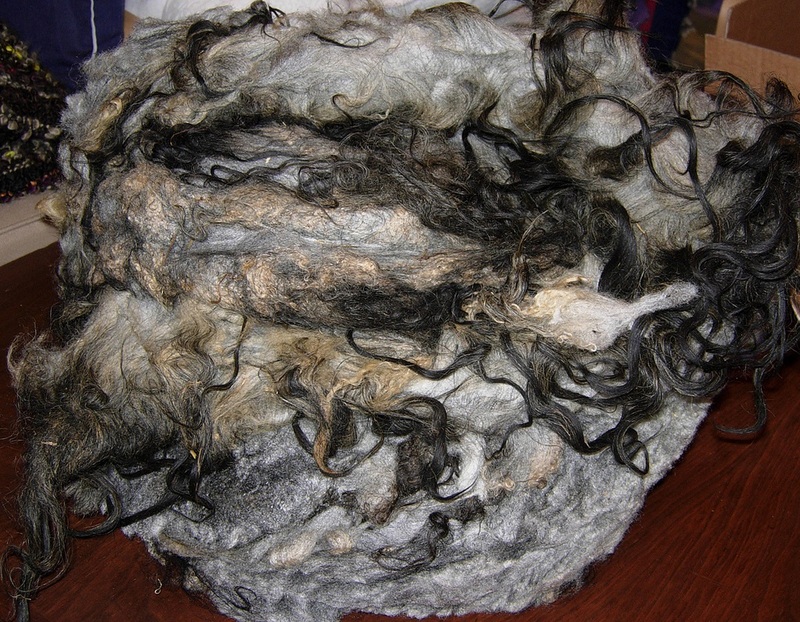 Ancient Norwegian sheep breeds had two kinds of wool: the long, stiff, water-resistant outer coat known as overhair, and the soft, fluffy inner layer known as underwool. The two layers were used to make different kinds of garments. The overhair was ideal for outerwear to protect from the elements, but the Lendbreen tunic was made almost entirely from underwool. Wool from most modern sheep breeds is akin to the ancient underwool, but wild breeds still have the two layers. Researchers are therefore securing the wool of Norwegian wild sheep from a farmer at Hareid in northwestern Norway’s Sunnmøre region. Then traditional wool spinnery at Selbu Spinneri wll separate the overhair from the underwool by hand. They have no idea how long this painstaking work will take (my guess is a long damn time). Once the overhair has been plucked out, the spinners will spin some of the underwool on a hand spindle just as it would have been done in the Iron Age. (Spinning wheels were invented in the 18th century. EDIT: According to the linked release about the project, that is, but several erudite commenters below have corrected the contention. I suspect is a translation error and they were referring to mechanized spinning.) The project can’t afford to spin all the wool they need by hand, so some of it will be spun mechanically. Because the tunic was woven in a diamond twill pattern, the Selbu Spinneri will sort the underwool into shades of grey so the darkest and lightest wool can be woven into this distinctive pattern. Once spun, the yard will be woven into the diamond twill textile on a vertical warp-weighted loom, an ancient machine that is simple, functional and slow. Consisting of a simple upright frame with two horizontal beams, the loom is leant against a wall. The vertical warp threads hang freely from the upper beam. To keep the warp threads taut, stones or other heavy weights are hung from the bottom of bundles of warp threads. The weaving is done from the top of the loom downwards and every line of weft thread is beaten tightly in place with a sword beater. The textiles will be woven by handweaver Lena Hammarlund from Gothenburg. Lena specializes in reconstructing prehistoric textiles. Lena Hammarlund from Gothenburg, you are so cool. After Ms. Hammarlund does her thing, the woven textile will be sewn into two tunics by traditional tailors from Heimen Husflid in Oslo. Once the tunics are completed, they will go on display, one at the Museum of Cultural History in Oslo, the other at the Lom museum. The latter is just six miles east of the Lendbreen glacier and has a large collection of artifacts recovered since the thaws began accelerating in 2006. Marianne Vedeler, Associate Professor at the Museum of Cultural History at the University of Oslo, hopes the reconstruction won’t just give us a new understanding of the manufacture of ancient woollen clothing, but will also have an impact on Norwegian clothing design today. I’m picturing a Norwegian wild sheep overhair trench coat. I know I’d wear one. This entry was posted on Tuesday, December 2nd, 2014 at 11:15 PM	and is filed under Ancient, Modern(ish). You can follow any responses to this entry through the RSS 2.0 feed. You can skip to the end and leave a response. Pinging is currently not allowed. is simply wrong – spinning wheels where invented somewhere in the East and came to europe in the late 12th century. In the 18th century, the first industrials spinning machines where invented! Excellent and important correction. I’ve edited it into the post. As a hobby, I’ve spun dog hair into yarn. While the best breeds for this are those who provide pure undercoat, like Poodles, for years I used the wooly undercoat of my Rottweiler, who had a non-standard coat. I needed to separate out the good stuff from the “hairshirt” pricklies of the outer coat. I just dumped the whole mess into a tub of water. By gently agitating the wool, the outer hairs would float to the top while the wooly bits sank. I would scoop them off with a flat sieve. That is some dedication to your craft, a day agitating hair and scooping out the discards. I bet you stuck with caps and pocket squares. …common delusion caused by hyperthermia. You mean hypothermia. I love your site! I do mean that! Thank you for the catch. The earliest illustrations of spinning wheels are: Baghdad: 1234, China: c. 1270, Europe: c. 1280. It is interesting that the Chinese and European dates are so close. Well, yes, spinning wheels were in use in Asia probably 10 centuries ago, the Middle East by the 13th century if not earlier, and had made it to at least Germany by the 1400s. Spinning wheels resembling the modern wheel probably began to emerge in the 1500s. But that is a small detail in an otherwise fascinating article about a woolen article of clothing in northern Scandinavia. The fact is that at the time this weaving was produced, the wool was spun using hand spindles– and that is the point. I have in my stash right now two fleeces from Icelandic sheep, which are direct descendents from wild-type Scandinavian sheep brought in by Viking settlers and unchanged for centuries. I love spinning Icelandic (sometimes with a spindle, sometimes with my lovely treadle spinning wheel). The outer coat is easy to remove by hand, and not terribly time-consuming. I use wool combs which makes the job faster, but one can remove the long hairs simply by grasping the base of a lock and pulling gently on the longer outer coat, which comes out easily, leaving the soft undercoat behind. 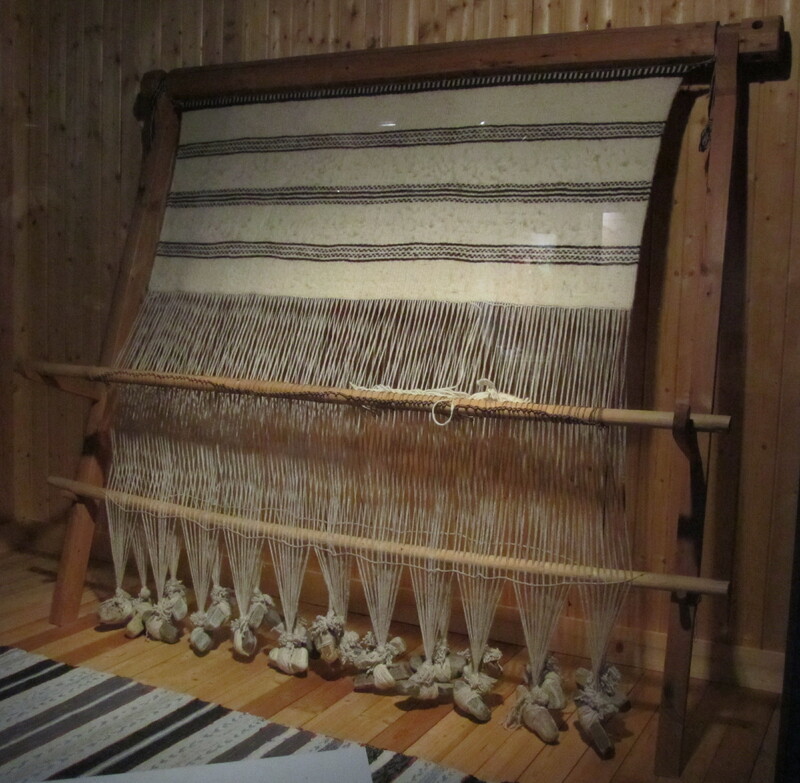 I once watched a rather video of an elderly Norwegian weaver weaving in the old way on a loom exactly like the one in the photo, from the beginning of making the edge band which is hung from the loom, and, in segments, through to the finishing of the bottom edge. She explained it cheerfully all in detail in her native language, which I did not understand a word of. Nonetheless, I stayed with her all the way, taken both by the weaving and by the weaver’s pleasant, smiling demeanor and her passion for her craft. One of my goals is to weave a traditional tunic (from my own spun wool). But I’ll stick with my floor loom with beam tension, thanks very much. A detail now corrected and expanded upon in interesting ways, thanks to Kiki, George and you. I should have known you’d have kin sheep fleeces in your possession as I typed and experience at practically every stage of construction. I can’t wait to see your own version of the traditional tunic. Did you read about Norway’s five-hour knitting marathon on their public television station? Oh sure, they were trying to break the continuous knitting record, but I still think it demonstrates a support for the traditional crafts that is shamelessly wonderful. I never can remember, but I will from now on. Granny Ambrosius, your seeds of wisdom fell on fertile ground after all! It isn’t uncommon to have “sheep to shawl” competitions where a group of shearers, spinners, and weavers start with a sheep and by the end of the day have a woven shawl. If you haven’t read it, “Women’s Work, the First 20,000 Years” by Elizabeth Wayland Barber is a fascinating history of fiber production and clothing manufacture. Also, “Woven Into the Earth, Textiles from Norse Greenland” by Else Ostergard (the O should have a slash through it and a little circle diacritical mark over the “a”) is also fascinating. The best preserved non-ecclesiastical/royal European medieval garments come from the permafrost preserved graves of the Norse Greenland settlements. My late wife was a spinner, weaver, and historian and some rubbed off on me. She would have had a lot more to say in these comments than I do. I thank you for this blog. During her struggle with cancer my late wife greatly enjoyed having your articles read to her. Just how costly is a few days’ weaving? Can’t afford? I did hear about the knitting marathon on Norwegian tv, and watched some of it, probably via YouTube (amazing what you can find on YouTube). I also heard that it was one of the highest rated programs ever in Norway, something else to admire the Norwegians for. George, thanks for the reference to “Woven Into the Earth, Textiles from Norse Greenland” by Else Ostergard. I’ll have to keep an eye out for it at used book shops and hope it isn’t painfully expensive. Loved this entry and I am so very excited for their re-creation of this important find. There is a great deal of work that has been done and continues to be done on Northern European Textiles. There is in fact a conference that occurs ‘Northern European Symposium of Archaeolgical Textiles’ “NESAT” for short. Their proceedings (ten or eleven now?) have many incredible articles on all aspects of textiles from the Northern Countries. Handspinners also have done a great amount of work through their desire for incredible fleeces to help preserve the ancient and rare breeds. Icelandic is of course one that comes to mind, but Spelsau is another and there are many more. Deborah Robson has done some incredible work on the researching and history of sheep breeds and is currently working on Shetland sheep.. which descended from Norweigan sheep more than a thousand years ago. The outer islands often preserved sheep breeds by simple isolation so we do have some excellent choices to reproduce ancient garments. I totally support the idea of bringing our renewable ancient resources into our modern age. It is part of that great question of sustainability both of culture, breed, and resource in the 21st century. Thanks so very very much for this great blog entry! Thanks so much for your blog entry! According to Heather Langford’s theses 2009, the spinning wheel may have been in use during an earlier period than the Han dynasty (206 BC–220 AD). Han was believed the forerunner onto the Overland Silk Road. However, the spinning wheel, the loom, the dye, the pigments… were used hunred of years before by the non-Han people nearby regions. I’m mostly Swedish but didn’t learn fiber arts from my Swedish grandmother; she’d mostly quit by the time I was old enough. My grandfather was diabetic; a double amputee below the knees- it’s only now I can understand what a life changer that was, especially in the late 60’s. She knit mittens and that was it; no more weaving, spinning, sewing, etc…all the cool things my Nordic friends and I do. I have Nothern dogs; Alaskan Malamutes have a lot of undercoat. Samoyds are amazing so if offered, grab it. It’s the cream of knittable/weavable feltable fiber. Next in line: my Ragdoll cat. I’m not much of a spinner but I can spin this with just my fingers. It felts easily, into tiny balls to make narrow scarves. IME, all these fibers separate into undercoat and guard hairs easily. Malamutes can be difficult because they pretend they’re in agony from even a soft, gentle brush. Some Siberians are dramatic like that too. I still would have chosen dogs wool over sheep. It’s probably a lot cleaner and less itchy.